​THEMAC Resources Group held its third round of Listening and Outreach sessions last Thursday and Friday, in Hillsboro and Truth or Consequences. We had several updates on the Copper Flat Project that we wanted to share with Sierra County, and these sessions, which we have pledged to continue every quarter, are a great place to do so. Heading into 2012, we continue to be on track towards startup and production in early 2015. The year is kicking off with the official start of our Federal Environmental Impact Statement (EIS) process, which will provide definitive information on the mine’s potential effect on the surrounding environment. We have been conducting studies and analyses since early 2010 in order to have the necessary information to set the base line for the EIS process. To ensure that the EIS is executed impartially, a third-party environmental firm is chosen by the Bureau of Land Management (BLM). For our EIS, the BLM has chosen Mangi Environmental Group. Mangi deals exclusively with EIS work, and has experience doing this in New Mexico. As we mentioned in a previous editorial, the Federal EIS process includes Scoping Meetings. These public meetings are essential to the process, allowing all citizens to voice their opinions and concerns, and be heard by the regulatory agencies. If you’re interested in being notified about the Scoping Meetings, please contact us. We also discussed an important engineering milestone. We are finishing our pre-feasibility study, the final report of which is expected in the first quarter of 2012. The analyses completed in the pre- feasibility will help define layout, mine plan, processing and metallurgy; water use; and tailings impoundment design. 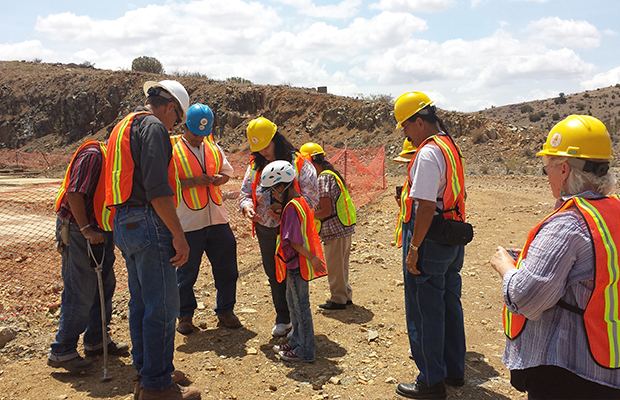 The pre-feasibility study not only feeds the design and layout of the mine and its related components, but it will also feed important information into the permitting processes. We will begin the final feasibility and engineering work in 2012 which will take nine to twelve months. We will provide additional information as these studies advance, bearing in mind that a definitive answer to questions may not come until the final feasibility study is complete. We discussed water, which is a concern for both the communities and THEMAC. The aquifer test is currently planned for March 2012, pumping from the THEMAC well-field approximately 8 miles east of the mine area. The results of this test will help finalize the groundwater model, which will then list potential impacts to surface and groundwater resources from the mine’s usage. There were a wide range of questions asked, some keyed to our water usage. One particular question asked why – if we only plan on using 31 to 39% of our declared water right – do we continue to maintain control of the full 7,481 acre feet? This is a great question. Not only are these water rights a corporate asset, but we cannot simply “give them up.” Further, these water rights are tied to the mine, specifically for the purpose of mining at Copper Flat. However, once we begin operating, we will only use the water needed for Copper Flat Mine processes. We have pledged to be good stewards of our environment, and that means managing the water use with a keen eye to water conservation. This makes economic and practical sense; pumping excess water eight miles uphill is an expense that we’d rather not incur. Further, as a zero discharge facility, storing any excess water at site would present an unnecessary risk of a permit violation. Lastly, any excess water stored at site would likely have to be contained in a lined pond or tank – another expense we would rather avoid. We assure you that, for all the above reasons, we will not draw more water than we plan to use. These are just a few highlights from the Listening and Outreach Sessions. We were pleased by the strong turnout and thoughtful questions about the project, and we hope we provided useful information in return. We would like to thank the Barbershop Café and La Cocina for hosting us, and we hope to see the continued presence of familiar residents as well as new faces at future sessions.